It seems that, unknown to me, I ended up in a pretty interesting place to spend Independence Day. The Village of Fishkill is right next to Hopeless Junction and Fishkill was a hotbed of revolutionary activity back in the day. The people I’m visiting have lots of books and they gave me two to read before we went out to see the sights. (Did you know I can read? Well, I can, and it’s a good thing, too.) Here’s me with my assigned reading matter. They actually gave me a quiz to make sure I’d done my homework! (Where have I landed this time??!!?? What was THAT about??!??) I must have passed because I got to visit Trinity Church in Fishkill, NY. The church was organized in 1768 and the New York Provincial Congress attempted to meet there in 1776. Since the building was under construction, there were no windows and birds were flying about, so the Provincial Congress moved down the block to the First Reformed Church of Fishkill. That church had windows! After the politicians moved out, they moved in some soldiers who were suffering from smallpox and the church became a hospital. I wonder how the poor, sick soldiers managed with the birds. 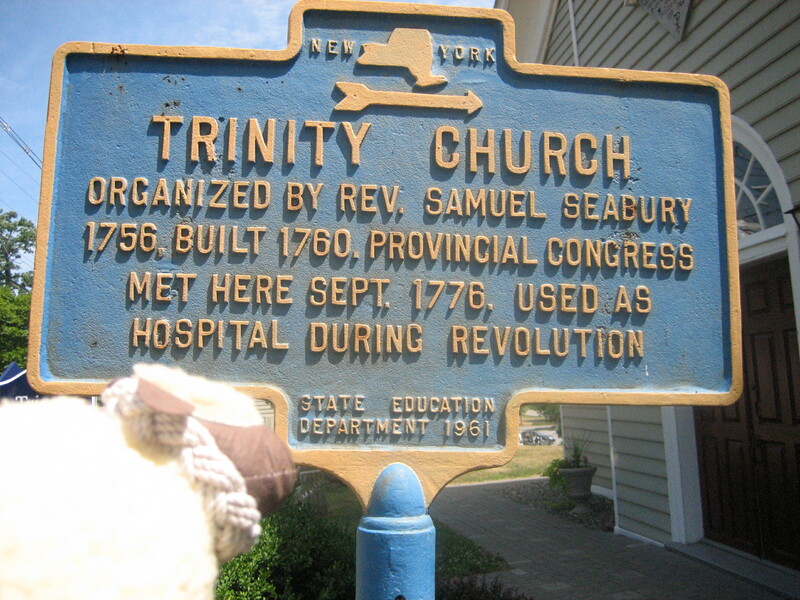 Here’s me again looking at the historical marker for Trinity Church. 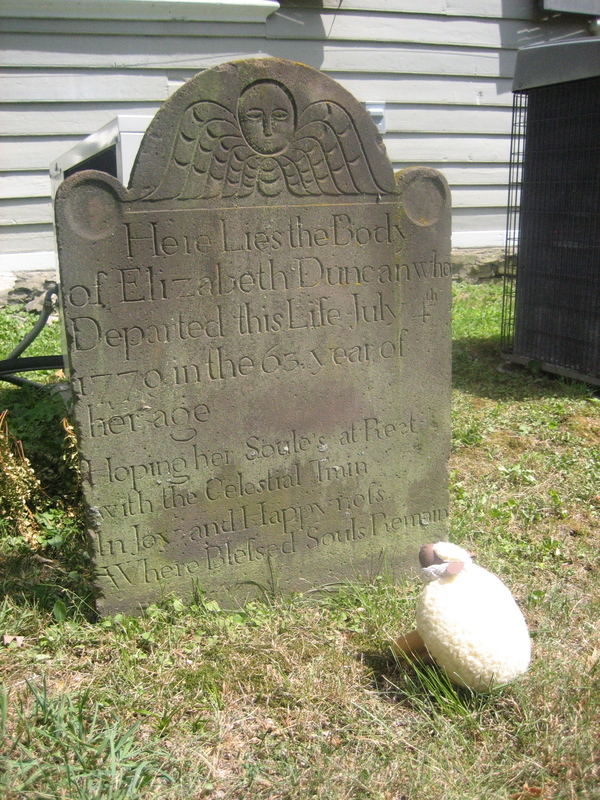 On a visit to Trinity Church’s churchyard, I found a very old grave marker. WOW! They took me to see a lot of other old buildings, but, honestly, I was getting pretty bored and I don’t remember anything much about them. I do think this old church and the churchyard were pretty cool and I’m glad I read those books, too. At night we saw a lot of local fireworks. They were awesome and I’m thinking I might like to become a pyrotechnician when I finish my trip and go back to Chappy (happy birthday, little brother Chappy) and my family in New Jersey. Chappy says thank you for the birthday wishes! 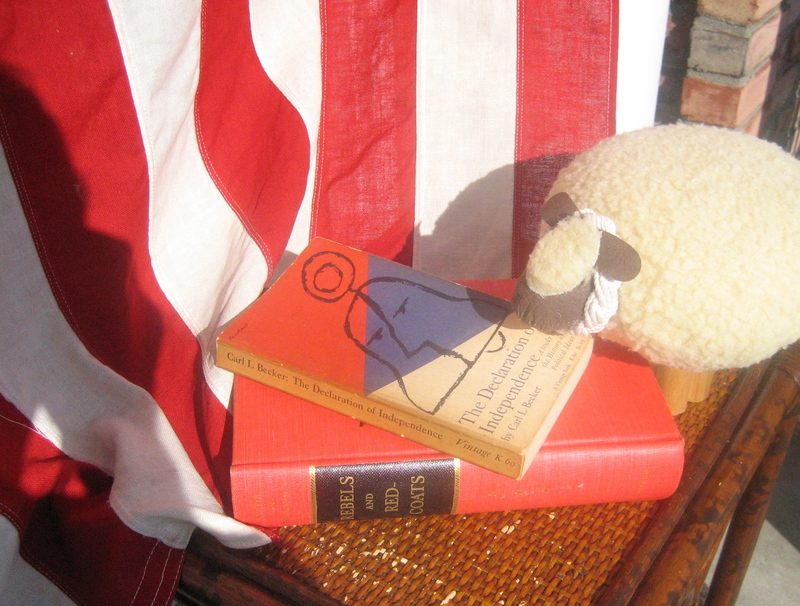 I am so glad that Ramble did not get waylaid for long and was able to enjoy his Independance in Hopeless Junction. Long live literature! I am so glad that Ramble did not get waylaid for long and was able to enjoy his Independence in Hopeless Junction. Long live literature!